Welcome to the second part of this year’s Q&A end of year podcast! In this second part (77 mins) we cover all the questions relating to Kata and Bunkai, Stance and Technique, Weapons, and Miscellaneous. 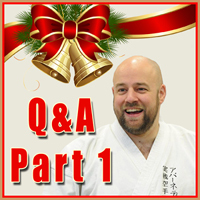 In the first part you can find the Self-Defence, Training and General Karate questions. The podcast includes some spoof advertisements! Some of these adverts contain very mild “bad” language. Nothing overly offensive, but it’s probably wise to ensure young children aren’t in earshot. Thanks for all your support in 2018! Welcome to the first part of this year’s Q&A end of year podcast! Thanks to everyone who submitted questions and topics! In this first part (70 mins) we cover all the questions relating to Self-Defence, Training and General Karate. In the second part (out very soon!) we will cover questions related to: Kata and Bunkai, Stance and Technique, Weapons, and Miscellaneous. As is something of a tradition with these end of year podcasts, I’ve also included some spoof advertisements :-) A big thanks to Dylan Tucker who also submitted some advertisements. Some of these adverts contain very mild “bad” language. Nothing overly offensive, but it’s probably wise to ensure young children aren’t in earshot. 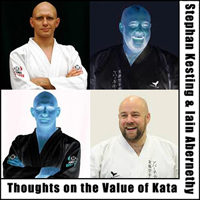 In this podcast, Stephan Kesting & I discuss our thoughts on the value of kata. I really enjoyed this conversation for two main reasons: Firstly, Stephan is a really nice and genuine guy. He was fun to talk to. Secondly, we disagree on the nature and value of kata; and that made for an interesting conversation. Neither of us changed our viewpoint as a result of the conversation, but we both enjoyed having it. Whatever your own view, we hope you will enjoy listening too. 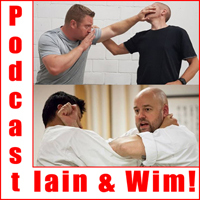 Iain and Wim Crossover Podcast! 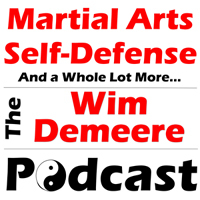 Welcome to this special cross cover podcast with myself and Wim Demeere! As some of you will know, I was a guest on Wim’s podcast a few months ago. I’m a big fan of Wim’s work and I was keen to get him back on my own podcast. We chatted through the options and thought it may be fun to do a crossover podcast with questions from listeners! Thanks to everyone who submitted them! While both Wim and I share a strong practical bias, I have a background in traditional Japanese / Okinawan systems and Wim has a background in traditional Chinese systems. It was our hope that our respective viewpoints would make for an interesting discussion … and I think it did! 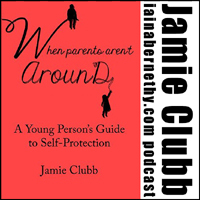 Lots of good information in this podcast! • Differences in Chinese and Japanese forms. This is NOT the latest edition of the podcast. This is an interview I did with Sami Wehbe of the Samotivation Podcast! 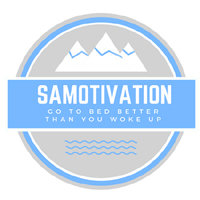 As you have probably worked out from the name, the Samotivation Podcast is all about motivation and self-improvement. Sami read my “Mental Strength” book a few years ago and reached out to interview me for his podcast. It was a fun conversation where we discussed the importance of stepping out side the comfort zone, dealing with fear and doubt, dealing with difficult people, and loads more besides. Sami has been kind enough to permit me to post the podcast in my own feed and I hope you enjoy it! 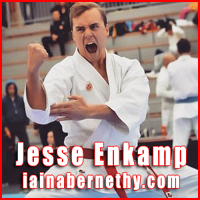 In this episode I’m joined by self-identified “karate nerd” Jesse Enkamp! I think Jesse does a great deal of good for the karate community. His panoramic view of karate, his prolific work rate, his eloquence, and his infectious enthusiasm combine to make him someone with much to offer. I’m really grateful to Jesse for joining me on the podcast.